First, our economy has still not fully recovered from the Great Recession more than a decade ago, and we must be prepared for the possibility of another economic downturn. Second, we cannot allow the fact that we are expecting a surplus and the likelihood of a significant deposit to the Rainy Day Fund lull us into a false sense of security and sap the urgency we need to confront our fiscal crisis head-on. In fact, a significant portion of the anticipated surplus must, as required by the recently enacted volatility cap, be deposited to the Rainy Day Fund and therefore cannot be used to address the budget gap. Although we could use that surplus to balance next year’s budget, our fixed costs – the true culprits behind our continued deficits – are growing by hundreds of millions of dollars per year. That growth eats into our ability to make much-needed investments in our future- things like a 21st century transportation system, education and workforce and economic development. A 5% across the board sales tax on everything except food and medicine would generate $3 billion in revenue. There will be a lot of tax exempt entities screaming about this. But what could be more fair? Some 3 months after election we’re all waiting for Gov. 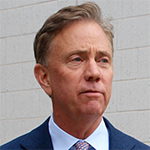 Lamont to announce his “plan” to create a viable CT ending the Exodus of our most able citizens. So far we have taxes on groceries and tolls. And CT’s public Unions say they’re confident their contracts are secure. So we know our future under Gov. Lamont. After 3 months Gov. Lamont remains “undecided” how to solve to CT’s long standing problems. But he’s confident CT Democrats will restore CT. Honey call the movers. Gov. Malloy is looking better in the rear view mirror. At least he had the good sense not to propose taking groceries – a tax that falls on the lower incomes. What do we do about the states high salaries, pensions, and benefits that are so out of control compared to corporate america. Until we get that under control we will continue down the same path that we have been for many years, it can no longer be sustained. Malloy’s failures are catching up to us quickly. All his gimmicks and the way he “kicked the can down the road” after promising not to…this state is in very real trouble. Good luck to Ned! With the problems that Danny left and this current legislature he is playing against a stacked deck!